Hashi is also frequently known as Bridges, and it's easy to see why. The aim is to draw horizontal and vertical 'bridges' between the circled number 'islands'. Each island must have as many bridges to it as specified by its number, and no bridges may cross. There can also be no more than two bridges built between any pair of islands, and the finished bridge layout must allow you to travel from any island to any other island just by crossing one or more bridges. 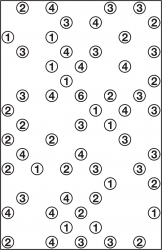 In the small example puzzle here the '1' island towards the top-left has only two other islands it can connect to, but one of them is another '1' - it can't join to that island because then there'd be no way of getting from those two islands to any other island. So the top-left '1' must join to the '4' to its right. There is only ever one possible solution to a Hashi puzzle, which can always be reached via reasonable logical deduction. 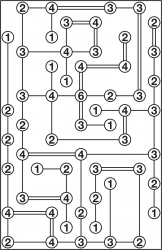 In general Hashi puzzles are somewhat easier than most Japanese logic puzzles, so they can be a pleasant light relief from trickier diversions! 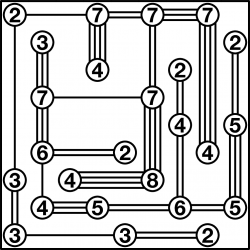 We can supply Hitori puzzles at a range of sizes and difficulties, including with variant rules such as allowing more than two bridges. For example, one of the samples below allows up to four bridges between pairs of islands.